Salads like a Russian Tuna Rice Salad (рыбный салат) are very different from the salads we eat in our western culture. They tend to be very hearty, heavy, meaty and filled with mayonnaise. Western salads are very green, leafy, and light in comparison. Many Russian salads have meat or fish in them, with beetroot, carrots and eggs. They are delicious, and can be a meal in themselves. You can even put this in a sandwich as a hearty tuna sandwich. Did I mention the mayonnaise? Very important. My friend Oxana introduced me to her Russian Tuna Rice Salad (рыбный салат). We went to the waterslides and brought a picnic lunch with us. Boy did that hit the spot after running after the kids all day. It’s a hearty, almost comfort food, hitting the spot, meal, kind of salad. I added the cucumbers to the salad, mostly because they were in season and I had plenty lying around. They added a great crunch. It’s important to de-seed the cucumbers, otherwise the salad will get wet and mushy from the seed pulp. Be sure to use tuna in spring water, not tuna in oil, as this will make the salad very oily when mixed with the mayonnaise. This Russian Tuna Rice Salad is super quick and easy salad to make, and tastes delicious. The salad that eats like a meal. Bon Appetit! Приятного аппетита! Russian salads aren't leafy, they're hearty! 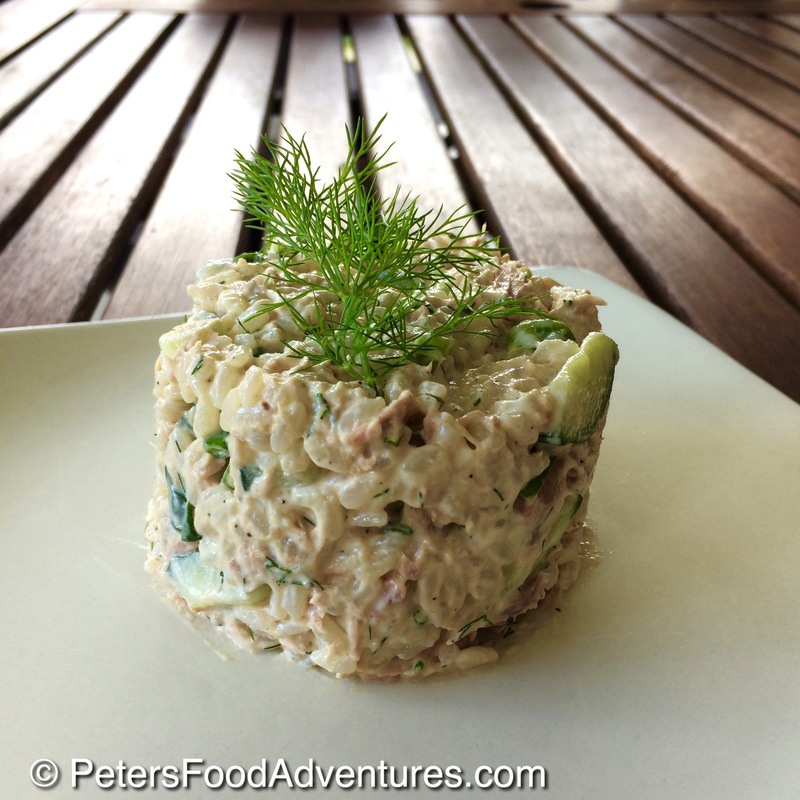 Russian Tuna Salad is perfect as a side salad, or even on a piece of rye bread! Wash and cook the rice according to instructions. Fluff it and let it cool. Chop cucumber into quarters, deseed and slice into thin pieces. 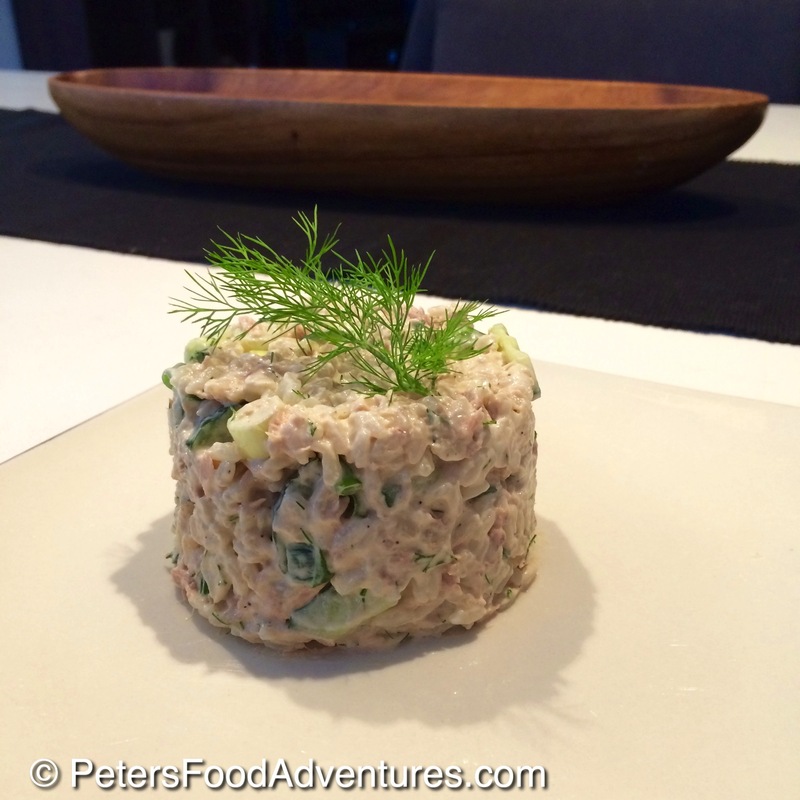 In a large bowl, combine rice, tuna, onions, cucumber mayonnaise, and dill. Season with salt and pepper, and add more mayonnaise if required. Refrigerate for 1 hour before serving.